“I find it in poor taste to use the death of an MP to try to score political points in the EU referendum debate.” I was rebuked thus, earlier. My, but don’t we get prissy and self-righteous, though, when it’s on our own sparkling-white doorstep? When the bodies aren’t Syrian infants but white, privileged British ones? Bit too close to home now, eh? Easier to deny there’s any connection between the murder of an MP by a fascist screaming ‘Britain first/First’ and the sort of politics that have consciously and deliberately fostered that act. Isn’t it? But relax. Chill. This will be a “lone nutter” as someone said to me, earlier. Because, as we know, Muslim/brown person equals terrorist, savage etc. Because ‘they hate our values,’ don’t they? White person, though, even a fascist with a gun and a knife, for God’s sake, well, he’ll be a ‘lone nutter.’ Not a product of those ‘values’ eh? Not our ‘values.’ Which is fortunate. Because then we’d have to take a long, hard look at those ‘values’ and the society spawned by them. Wouldn’t we? So now you know. Stir the racist swamp and monsters emerge. Drip, drip, drip racism, spread anti-immigrant poison, demonise terrified refugees as as “swarm”, dehumanise the Other, do it every day, year in, year out. In the media, from the mouths of politicians. Buy into yourself with your mates down the pub. 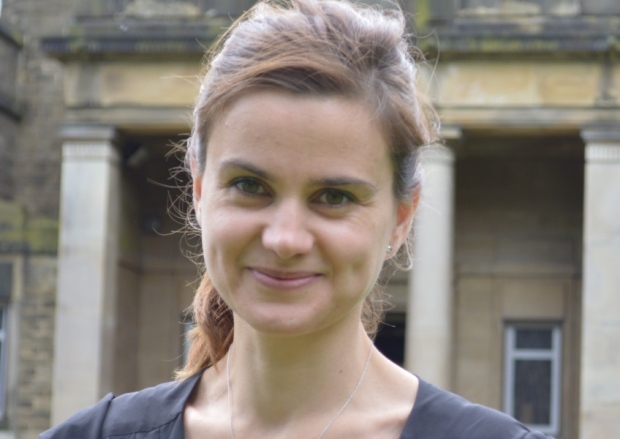 Until Jo Cox is murdered. Will you stop now? Have you got your country back now? So what drove this man to this attack? Could it be, possibly, a combination of factors? The volunteering he was doing in 2011 – was he still doing it? Was he one of the victims of the incessant budget cuts of the past few years? Of welfare cuts? Had this left him once again isolated? Had the drip, drip, drip of daily racist anti-immigrant propaganda once again destabilised him? Had he then seen his new MP defending immigration and calling for tolerance to immigrants, whilst he was told daily that his situation was caused by immigrants?